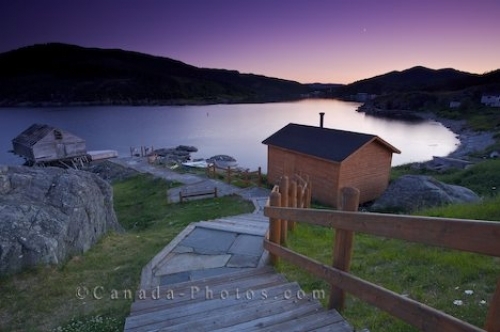 Follow the steps down to the waterfront in the town of Fleur de Lys in Newfoundland, Canada and take advantage of the picnic area while enjoying a spectacular sunset. Pink and purple hues highlight the sky over Fleur de Lys, Newfoundland as the sun drops behind the hillsides. Steps leading down towards a shed at a picnic reserve during sunset in the town of Fleur de Lys, Dorset Trail, Highway 410, Baie Verte Peninsula, Newfoundland, Newfoundland Labrador, Canada. Picture of a picnic area around the coastline of the town of Fleur de Lys in Newfoundland, Canada.